I read 93 books in 2016. For a while I thought I'd make it to a hundred, but no matter--this is still a huge leap, one more book, in fact, than I read in 2015 and 2014 put together. I wish I could put my finger on just why my reading this year made such tremendous strides. Part of the reason is purely practical--I read a great deal of comics this year, and no small amount of YA and single-volume anthologies, and these all made for rather quick reads. But I also feel like I've broken through a wall with my reading--with identifying books I'd like to read and am likely to enjoy, and with organizing my reading so that I'm not overwhelmed by too many heavy books, or too many trivial ones, and end up feeling dispirited and not willing to crack open another cover. This was particularly surprising when you consider that 2016 was the year I broke my habit of not reading genre trilogies, or at least not carrying on with them past the first volume. I read the first two volumes of N.K. Jemisin's Broken Earth trilogy, and of Dave Hutchinson's Fractured Europe trilogy. I read the last two volumes of Ann Leckie's Imperial Radch trilogy, as well as several starting volumes in trilogies that I probably won't be keeping up with. As I've written (including later in this piece), there are problems with how SF is currently constructing its trilogies, and they're present in all of these books, but nevertheless I found a great deal to enjoy in each of them. We'll have to see if I'm able to maintain the same rhythm in 2017, but in the meantime I'm glad to report that as well as delivering quantity, this year also delivered quality, with quite a few remarkable reads that stood out from the pack. (As for bad reads, there were surprisingly few, though I'm sad to say that most of them were concentrated in this year's Arthur C. Clarke Award shortlist.) As usual, presented in order of author's surname. 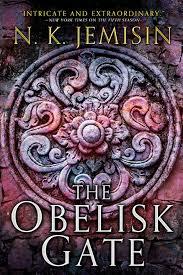 As I've written in my review of The Obelisk Gate, the sequel to this Hugo-winning marvel, there's a longer conversation to be had about how the genre is currently constructing its trilogies, and how the result tends to be front-loading a lot of worldbuilding information in the first volume in a way that leaves the later ones shapeless. Even acknowledging that problem, however, there's no denying that the way in which The Fifth Season introduces us to its world and its characters is instantly compelling and fascinating. Following the lives of three women in a world given to cataclysmic earthquakes and volcanic eruptions, whose power to control (and often exacerbate) these outbreaks is viewed with fear and hatred, The Fifth Season touches on so many topics that you can hardly believe that it works, much less works as well as it does. This is a novel about how people are shaped by hardship: the hardship of knowing that catastrophe is always just around the corner, and the hardship of being hated, oppressed, and hunted for something you can't control. It's a novel that takes some of the core tropes of the superhero genre (chiefly the X-Men stories) and exposes the cruelty and horror at their core--as well as tying them much more strongly to issues of race and racism than any previous attempt at the genre. And it's a novel that effortlessly combines the tropes of epic fantasy and far-future, post-apocalypse SF into a stew that makes them all its own, and makes discussing its genre a delight in its own right (I still maintain that its absence from next year's Clarke shortlist will be a crime). Whether or not the Broken Earth trilogy manages to stick the landing, The Fifth Season on its own is an important and impeccably structured work. If you'd told me a year ago that my favorite comic of 2016 would be a Marvel superhero comic, and that it would star that boring purple guy from Age of Ultron, I would never have believed you. But here we are a year later, and there is no book I read this year that I'd like to evangelize for more than Tom King's run of The Vision. King takes a well-worn premise--robot tries to live as human, with disastrous results--and executes it with a combination of hard-headedness and compassion that make the story's inevitable turn towards tragedy both fascinating and heartbreaking. We know, from the outset, that the Vision's experiment in normalcy will end in carnage, but the family he constructs for himself--wife Virginia and twin teenagers Vin and Viv--are so instantly winning, despite or perhaps even because they share their father's stiff mannerisms and tendency to be over-literal, that you can't help but wish for them to find a way to exist in a world that they are so unsuited for. The second half of the story, which involves more of the Avengers, is less gripping, but it also brings in one of the core questions of the superhero genre, one that is seldom handled with the seriousness it deserves. So many characters in this genre are created for a purpose, whether good or evil, and their stories revolve around rejecting, embracing, or failing to fight off that purpose. King asks the much more important question: not whether the Vision or his family are doomed to be bad guys or good guys, but whether any of them can ever simply be people. The endlessly-reinventing Knox's latest novel conjures the ghost of Stephen King, but only to rebuke him for a lack of imagination and grit. In Knox's story, when a group of strangers are stranded together by a breakdown of the laws of rationality and order, the danger they face isn't man's inhumanity to man. On the contrary, it's the insistence that they continue to behave like human beings, even in the face of the impossible and of their own looming surrender to it, that drives our heroes to the breaking point. The are forced to confront the question: is it better to face death as a community, or to shirk off the obligations they feel towards one another and die unencumbered? In the meantime, Knox delivers an impeccable work of horror, one that ranges from the existential to the scatological, and which finds tension and anxiety in the most mundane details of survival. I'm not being terribly original in highlighting Rankine's book of poetry, and indeed so many of the ideas she raises here have become bywords of the Black Lives Matter movement that finding them here often felt more like encountering an old friend in an unfamiliar environment. But the clarity of the ideas that Rankine expresses--even in a medium that is often known for its obliqueness like poetry, and even in her own chosen form, which is often more like linked, short essays--is startling. Citizen is about many things, as it tries to grapple with the reality of life for African-Americans in the present moment. But what struck me about it during my first reading was Rankine's struggle with anger, as an artist, a person, and specifically a black woman. Anger is essential to how Rankine sees the world, and it only grows as the list of black men, women, and children victimized and often murdered by the police grows longer. It is a righteous anger, and one that she is right to express. But at the same time, she is also aware of how anger can consume, and make it impossible to live and to create. It's not a simple question--for all that people, and especially privileged people, like to treat it as such--and Rankine's handling of it in this book is far from simplistic. Drawing on her own life, and on examples of other black people in the public eye who struggle with the same question of anger, she produces a philosophical treatise that is all the more powerful for not being able to come to an answer. I wrote several thousand words about Samatar's second novel, the companion piece to her equally wonderful A Stranger in Olondria, earlier this year, and yet I still don't feel that I've fully grappled with how special and revolutionary this book is. This despite the fact that Histories initially feels a great deal more conventional, and much easier to sum up, than Olondria. Its use of familiar epic fantasy tropes and styles is more pronounced than the previous novel, and whereas Olondria circled around the edges of a fantasyland civil war, Histories sets its story almost in the middle of it. What ultimately becomes clear, however, is that just like the hero of A Stranger in Olondria, the four women who tell the story of The Winged Histories are trying to give shape to their lives by casting them into literary forms--in this case, the forms of epic fantasy, even if none of them are aware of that genre or would call it that. And, one by one, they discover the limitations of those forms, especially where women and colonized people are concerned. Not unlike Olondria, The Winged Histories is ultimately forced to ask whether it is even possible for people to tell their own stories using the tropes and tools left to them by their oppressors. If the entire purpose of your existence is to be the Other, or the object, in someone else's story, can you ever take their words, their forms, and make it a story about yourself? For most of the novel's characters, the solution is ultimately to fall silent, and yet The Winged Histories itself rings loudly. As much as it is a rebuke of the fantasy genre, it is also a major work within it, and one that deserves more discussion and attention than it has received. White is for Witching by Helen Oyeyemi - A haunted house story with a twist, in which the ghost of racism and xenophobia infects the present generation and must be exorcised. Aurora by Kim Stanley Robinson - A bleak counterpoint to Robinson's freewheeling 2312, which warns against dreaming of a home in the stars and neglecting the one we have here. Natural History by Justina Robson - A space opera whose setting is a sort of stepping stone to Banks's Culture, with AIs and living ships organizing in pursuit of self-determination. The Underground Railroad by Colson Whitehead (review) - A historical novel that refuses the comfortable (albeit horrific) embrace of the past, reminding us that history is happening right now. The Sorcerer of the Wildeeps by Kai Ashante Wilson - A rude, rambunctious reminder that epic fantasy is capable of so much more than we give it credit for. It's nearly time to sum up the year's reading, and I have a great deal to talk about on that front. Unfortunately, I've been felled by a flu, so I'm hoping I'll be back my feet and in a state to write meaningfully about, well, anything by the time the 31st rolls around (which, as everyone knows, is the only proper time to talk about the year's best anything). In the meantime, however, here are some thoughts about some of the books I read in the last third of the year, including some major genre publications. 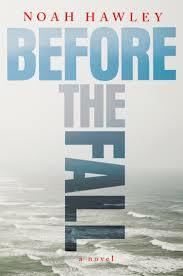 Before the Fall by Noah Hawley - Like, I suspect, a lot of people, I picked up Hawley's third novel on the strength of his work adapting the Coen brothers' Fargo into one of the most delightful and unusual television series of the last few years, arguably the best example of the increasingly popular anthology series format (Hawley is also the showrunner of the forthcoming Legion, which if nothing else bids fair to become the first MCU property with a sense of style). One of the things I like best about Fargo is its commitment to featuring characters who are complex and multifaceted, more flawed and foolish than evil, even when they're doing despicable things. That, unfortunately, is not a trait that Hawley has carried over to this novel, which takes place in the days following the crash of a private jet. The sole survivors are Scott, a down-on-his-luck painter, invited at the last minute as a random act of kindness from one of the millionaires on the flight, and this same millionaire's young son. The chapters describing the build-up to the flight, the immediate aftermath of the crash, and Scott's harrowing swim back to shore, towing his fellow survivor behind him, are breathtakingly tense and instantly compelling, but they set a bar that the rest of the novel can't reach. Once Scott and his charge are rescued, Hawley struggles to find a hook for the rest of the story. He tries to craft a mystery about the cause of the crash, delving into the pasts and psyches of the other passengers and crewmembers (hence the "before" of the title). But though the readers know, because of the kind of novel we're reading, that the plane must have crashed because of foul play, not an accident or pilot error, it's simply not convincing that all the characters in the novel would immediately leap to that conclusion--especially when they start pointing accusing fingers at Scott, as if being the sole survivor of a plane crash and then making an impossible, hours-long swim for your life is something a person could plan for. Hawley's narrative has several interests, but at its core Before the Fall is a novel about masculinity, with many characters, on and off the plane, exemplifying diseased versions of it: arrogant bullies, weak-willed man-children, emotionless automatons with no communications skills, self-absorbed narcissists who expect women to save them from their own failings. That's certainly a worthy message, but Hawley is so bald with it, and gives these portraits so little shading, that it's hard not to feel that he's browbeating us with them. Where Fargo expects us to pity, and even on some level enjoy, its depraved characters, Before the Fall wants to be sure that we know exactly how we're meant to feel about each and every member of its cast. Even worse, its emblem of "good" masculinity, Scott, veers a little too close to Marlboro Man stoicness to really work as a counterpoint to toxic masculinity. The book keeps claiming that Scott is a screw-up, but what shows up on the page is a strong and silent type who is unthinkingly heroic and kind to women, animals, and small children. It's as much of a stereotype as any of the "bad" men it's meant to act as a counter to, without ever acknowledging that it's these simplistic, idealized portraits that often screw men up, as much as any of the diseases of the soul that the book does recognize. Ninefox Gambit by Yoon Ha Lee - I've thought for a while that Lee is the closest thing we have to a successor to Iain Banks, and his debut novel confirms me in that impression. Like Banks, Lee specializes in a brand of space opera that tends to challenge our assumptions about the fundamental building blocks of the universe by detaching words and concepts from their accepted meanings. Ninefox Gambit is set in the same universe as Lee's previous short stories "Ghostweight" and "The Battle of Candle Arc", in which certain weapons and propulsion technologies rely on the consensus acceptance of a specific "high calendar". Under different calendars, different technologies either stop working or gain tremendous, reality-bending powers, and the ruling power in the novel's setting, the Hexarchate, is thus primarily occupied with brutally enforcing its own calendar, and constantly suppressing rebellions that support themselves by adopting their own timekeeping approaches. The metaphor for cultural imperialism is obvious, but beyond that, Ninefox Gambit is remarkable for how it builds a universe that is not only describable through math, but changeable with it. Military forces in the novel's world can affect reality--defend themselves against "calendrical" weapons, or impose their own effects on the fabric of the universe--by adopting "formations" that conform to the current mathematical paradigm. Breaking formation, meanwhile, can lead to disastrous, often grotesque results, which of course reflects in the governing values of the Hexarchate's military. As in the short stories, this is a pretty neat concept, and one that presents a fun challenge to the reader, who must work out not only what is going on, but what the fundamental rules of the universe are. But the greater length and more clearly-defined structure of a novel make it easier to notice that beneath its unusual worldbuilding, the story that Ninefox Gambit tells is a rather conventional one. Faced with an infestation of "calendrical rot" in one of their key holdings, the Hexarchate deploys disgraced infantry captain Kel Cheris, whose main claim to fame is her facility with math, and particularly her ability to think outside the box when faced with calendar-based weaponry. Cheris is supplemented by General Shuos Jedao, the Hexarchate's most gifted strategist, who was executed for treason after turning on his own troops and killing millions of the Hexarchate's own citizens. Jedao is present here as a sort of ghost anchored to Cheris, a voice in her head whose attitudes, memories, and proclivities start to bleed into Cheris's the more she comes to rely on him. For all the bells and whistles, this is a rather familiar premise, and though Ninefox Gambit delivers several engaging set-pieces--both space battles and ground combat, after Cheris's troops gain a foothold on their target--it ultimately feels rather by the numbers, the triumphs and setbacks arriving precisely on schedule, and with very few surprises or genuine thrills. (The fact that the novel is setting up a trilogy is an obvious problem here, as Lee is clearly more concerned with laying out the history and culture of his setting than in doing anything particularly unexpected with them at this stage.) A lot of the novel's force is clearly intended to come from its character work--Cheris's conflicted feelings about the Hexarchate, her struggles to assert herself as a fleet commander, and the relentless mind games that Jedao plays with her--but here, too, what shows up on the page is strangely underpowered. Cheris's growing anguish over the cost of her campaign, for example--the troops that she sacrifices in brilliant but costly tactical gambits, or the civilians she exposes to horrific weapons--which is supposed to be the crux of the novel, never feels more than skin-deep. It's particularly interesting to note that, when stripped of their respective central conceits, Ninefox Gambit strongly resembles Ancillary Justice. The structure of the Hexarchate's militaristic, doctrinaire society, the carefully regimented and manners-obsessed culture of its military, even a minor but clearly significant plotline about the Hexarchate's AIs and their desire to be recognized as sentient--these are all central elements of Ann Leckie's breakthrough novel, as is the fact that both novels' stories ultimately come down to a retelling of The Count of Monte Cristo, centering on a deeply loyal innocent who is finally pushed too far by an abusive system, and swears revenge. Some of this, no doubt, comes down to the fact that both Lee and Leckie are telling stories about the crimes of empire, and about the near-impossible difficulty of dismantling such a system. But I also have to wonder if we haven't accepted certain tropes and conventions as de rigueur for a certain kind of space opera. To bring this back to Banks, one of the things that made him exceptional was his ability to imagine different and strange social structures, and then use them to reflect back on burning political questions. I have no doubt that Lee is capable of doing the same, but I don't think he's managed it with Ninefox Gambit. The Obelisk Gate by N.K. Jemisin - There's probably a longer discussion to be had about the current state of trilogies in SFF, and how to construct them so that the first volume isn't simply front-loading worldbuilding information in a way that, while engaging, leaves the later volumes without a shape. It's a problem that afflicted the Ancillary books, and one that I suspect will prove to be an issue for Ninefox Gambit's sequels, and it shows up in force in Jemisin's follow-up to the stunning, Hugo-winning The Fifth Season. That's not to say that there aren't things to praise in The Obelisk Gate, which splits its narrative between the heroine of The Fifth Season, Essun, now living in an underground community trying to survive the aftermath of a supervolcano explosion, and her daughter Nassun, who was kidnapped by her father in the previous book. The Nassun chapters are particularly powerful, charting the quick thinking and manipulation she has to deploy in order to survive in the company of her emotionally unstable father, who has already killed her brother for the crime of being an "orogene", people who can cause and quell earthquakes, who are reviled and hounded in the series's world. They also give us a different perspective on the relationship between Essun and her children. After an entire novel in which Essun obsessively pursued her daughter without ever giving us a glimpse of their family relationship, it's not really a surprise--and yet queasily disturbing--to learn that she repeated her own history of abuse in her "training" of her daughter. Nassun's resentment of this plays into the twisted, codependent relationship she develops with a former Guardian, Schaffa, one of the class of beings who abused orogenes like her mother, but who is the only person who offers Nassun unconditional love and support. There are some similarly powerful notes in the Essun chapters, in which she tries to feel out the contours of a community in which orogenes live openly and are even in positions of authority, finally concluding that the peace she's been presented with is transitory. But it's here that The Obelisk Gate bumps up against the problem of its overarching plot, and the fact that Essun's primary task in this novel is to learn enough so that she can save the world in the next book. This leaves the novel feeling--like so many middle books before it--like scene-setting. And unlike The Fifth Season, which did the bulk of the worldbuilding for this universe, it doesn't have enough new and interesting information to reveal to make that process enjoyable. The Broken Earth books are at their best when they discuss the effect that living with prejudice, oppression, and abuse has on people within those systems--though it must be noted that after so many instances in which orogenes lash out and kill dozens, hundreds, and in some cases millions, the argument that the prejudice against them, and even the barbaric practices put in place to control them, are completely unjustified is starting to lose its force. I'm a lot less interested, however, in the mystery the novel teases about the source of orogeny, the mysterious obelisks that float in the sky above the planet, and the ways in which Essun can use them to save the world. The Obelisk Gate needed to lay out these elements as compellingly as The Fifth Season built this series's world, and it doesn't quite succeed at this--by the final set-piece, in which Essun uses her newfound control over the obelisks to defeat an army trying to invade her community, her powers feel ungrounded, and sharply contrast with the visceral depictions of day-to-day life for orogenes. 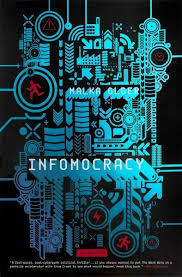 Infomocracy by Malka Older - If nothing else, a reader turning the last page of Older's debut novel has to tip their hat to her for her prescience. Or perhaps a better way of putting it is that Older, while she was writing this book, had her finger on the pulse of issues and problems that have only recently come to dominate the conversation about how democracy in the 21st century functions, and of how it fails. Set in a near-future, Infomocracy imagines a world in which the familiar geopolitical rules have been replaced by "micro-democracy", with the world divided into "centenals", each containing one hundred thousand residents who are free to vote for any government they wish, be it nationalistic, ideological, or corporate. Different governments can thus have citizens all over the world, which can mean that neighboring streets can have different laws and government services. Every ten years, the world holds an election, in which the governments try to win over new centenals in order to cement their power, and hopefully make a bid for the coveted "supermajority". If you sum up Infomocracy's plot, in which Ken and Mishima are caught up in various crises, investigate challenges to the election, and try to navigate a budding romance, there doesn't seem to be much there. Even at its best, the story never rises above a competent but not very exciting technothriller. What makes the novel work are the ways it exposes the cracks and crevices, not only in its imagined and not very plausible democratic system, but in our own. Pretty much everything we've been talking about in the wake of 2016's multiple failures and collapses of democratic systems is here: the rise of the far-right and the allure of violent authoritarianism, even and perhaps especially for people who don't have it that bad but just want to feel powerful; the role of tribalism in voting patterns; the usurpation of government roles by corporations; the failure of the media to inform the public; the failure of the public to inform itself even when the information is made available to it. Above all, the sad realization that people don't behave any more rationally when they participate in democracy than they do anywhere else, and that no matter how hard you work to create a system that's fair and equitable, it can always be destroyed by people who crave power, and others who simply don't care enough to stop them. While not exactly bleak, Infomocracy is a sobering meditation on the truism that democracy is the worst system of government except for all the others. 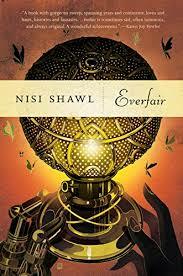 Everfair by Nisi Shawl - Shawl's first full-length novel has an intriguing but also challenging premise. It imagines that in the late 19th century, shocked by the human rights abuses of the regime of the Belgian king Leopold II in the Congo (which, in the real world, ended up claiming the lives of millions of people), a group of English socialists and African-American missionaries band together to purchase the land and turn it into a safe haven for refugees from violent colonialism. Making common cause with a local African king, and powered by advanced technology, the new nation of Everfair becomes a steampunk utopia in the midst of some of the worst abuses in human history. And therein lies the challenge, of constructing a utopia in a way that doesn't betray the novel's goal--using steampunk to address and ameliorate the racism of history, instead of papering it over--while still telling a compelling story. Both on the personal and political level, Everfair raises some interesting prospects. The tension between the European socialists and the African locals plays out in multiple ways, which both highlight the former's frequent blindness to their own privilege and racism--insisting, for example, that making Everfair's official language English is a "unifying" measure--and the latter's vulnerability to exactly the same excesses as the white regimes they've escaped--when Everfair becomes embroiled in the first world war, its weapons manufacturers begin employing child labor in order to meet quotas, and the African king who becomes Everfair's military leader resents sharing power with democratic institutions that he sees as imposed on him by the same Europeans who abused his people. Some throughlines, such as the spiritual transformation of an African-American clergyman who finds himself drawn to African religion, or the tense relationship between a free-thinking poet and her lover, a mixed-race woman who correctly senses that her heritage is being tolerated rather than embraced, remain intriguing throughout the novel's length. But taken as a whole, Everfair is too bitty to make much of any of its subjects. Shawl's approach is to make her story deliberately scattershot, jumping every few pages from one character to another, skipping long stretches of time, and eliding some of the important stepping stone along her story's path. A problem is often introduced in one chapter, and then in the next chapter we learn that it has been resolved, avoided, or simply endured, and it's now time to address the next issue. The result is that Everfair's title nation never manages to feel like a real place, in whose survival the reader can feel invested. The novel ends up feeling trapped, rather than buoyed, by its premise. As someone who lives in a nation that started out as a utopian pipe-dream forged in reaction to persecution and genocide, and which very quickly gave way to realpolitik, ugly compromises, and unacknowledged internal prejudice, I know that there's a vivid, complicated story to be told about such a place. Everfair never quite seems willing to delve into that story, preferring to skim its surface. 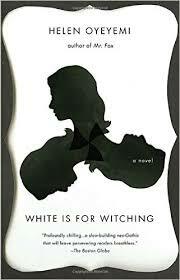 White is for Witching by Helen Oyeyemi - One of the blurbs for Oyeyemi's third novel compares it to the writing of Shirley Jackson, which strikes me as incredibly apt. Like Jackson's ghost stories--most especially The Haunting of Hill House--White is for Witching imagines a haunting in which the haunted house is a character in its own right (one that, in this novel, even speaks), a malevolent entity that nevertheless perceives itself as protecting its inhabitants, or at least the ones it cares about. These last are largely confined to the women of the Silver family, who have lived in the house in Dover for four generations, unaware--or perhaps unwilling to acknowledge--how much its influence has affected their lives. The added twist here, unsurprisingly for an Oyeyemi novel, is the issue of race, with the house, having been primed by the original Silver matriarch, directing its malevolence towards people of color, immigrants, and anyone it defines as an outsider or an interloper. A lot of ghost stories have racial animus or genocide at their root, but in most of them, the story ends up being about the "innocent" descendants of people who committed those crimes laying them to rest, or about unwitting interlopers into an ancient feud being targeted by the indiscriminately enraged ghosts of the victims of racism, who simply want someone to take their anger out on. White is for Witching takes a more hard-headed approach, finally revealing that it is the Silver women themselves who are made predatory and dangerous by their history of racism--that by refusing to acknowledge it and take active steps to counter it, they end up perpetuating it. The book's story revolves around the youngest Silver girl, Miranda, who falls in love with Ore, a Nigerian adoptee who senses both the danger in the house, and the fact that Miranda may lack the strength or the willingness to fight it. The storytelling here is, typically for Oyeyemi and true to the book's Jacksonian heritage, swimming in metaphor, soft spaces, and weird turns of narrative, not all of which are explained by the book's end. But the allegory underlying it all is blatant and undeniable: if Miranda wants to love a black girl, and wants that girl to be safe with her, she has to be willing to take responsibility for her past, and exorcise her own demons. What to say about Westworld? How to sum up its frustrating, fitfully brilliant first season? The problem with Westworld--or rather, not the problem, because this is a show with so many different problems, which is, of course, a problem in itself--is that it never quite seems to cohere into the sum of its parts. Those parts were frequently magnificent--from incidental but beautiful touches like Ramin Djawadi's playful soundtrack choices, to core elements like the fearless performances of Evan Rachel Wood and Thandie Newton--but even at the end of the show's ten-episode first season, I find myself asking the same question that I asked at its beginning: is this show about anything other than itself? The scattershot nature of the show's writing, its haphazard brilliance, has made it into the best sort of thinkpiece fodder. At one point or another, we decided that Westworld was: a critique of the HBO brand and its reliance on violence and misogyny; an exploration of the conventions of video games and how players interact with them; a chunky science fiction story about the emergence of consciousness in machines; an allegory about slavery and oppression; a meta-examination of how stories are constructed and achieve their effects; a philosophical treatise on what it means to be human. There are hints of each of these shows in Westworld, and if you focus your view on an individual element of the show you might even be able to make a coherent argument for one or the other of them. But as soon as you widen your view, and try to take in the whole, you realize that it doesn't actually exist. It's a show that is, simultaneously, full to the brim with ideas, and completely empty. You get the sense that the writers realize this, and that it's this realization that might have been behind their most destructive, most boneheaded choice: the twists. Of all the arguments you can have about Westworld, all the aspects of the show that you can praise or criticize, surely one thing is not up for debate: this is one of the most horrendously-paced and -structured seasons of television in recent memory. And most of that comes down to the show's reliance on twists, chiefly the big one: that the naive, goodhearted visitor to the show's titular theme park, William (Jimmi Simpson), is also the villainous, murderous Man in Black (Ed Harris), whose stories are told thirty years apart--enabled by the fact that the park's robotic hosts are ageless, and trapped in loops of narrative and of their own desperate yearning towards consciousness. It's almost fascinating to watch the season's final, extra-long episode expend nearly half its running time on the painstaking, laborious revelation of a twist that most of fandom--certainly the parts of it that are online and discussing the show--has been taking for granted for at least a month. While this might sound like the most finicky of fannish complaints, it actually gets at the core of what makes the show so frustrating and unsatisfying. Westworld, by its very nature, has no characters. Almost everyone on screen is a robot whose personhood is, at best, a work in progress, and at worst, a delusion created to further a mysterious someone's master plan. (Meanwhile, William, the only human character who undergoes any kind of transformation, has it off-screen, the better to conceal the big reveal.) For the same reason, it has no plot--all of its characters are trapped in loops of story that weren't particularly original or interesting the first time around. Co-creator Jonathan Nolan's previous show, Person of Interest, was faced with essentially the same challenges, and dealt with them beautifully, transforming a rote procedural into the origin story of a genuinely alien artificial intelligence. Perhaps because of its HBO pedigree, Westworld eschews such conventional forms, and instead assumes that it can string its viewers along with the promise of an explosive reveal. It is, essentially, trading on its prestige, banking on its viewers' assumption that there's no way HBO would spend this much money and effort on a show with so little to say. But in the age of internet fandom, such assumptions are unfounded. It is simply no longer possible to count on surprising your audience in the way that Westworld clearly expects to. It's time for TV writers to let go of the Lost model, or at least to let it evolve--to deliver twists faster and sooner, so that viewers feel like active participants in the story, instead of a captive audience whose indulgence is being sorely tried. What if, instead of waiting until the end of the season finale to reveal what is ultimately a rather anodyne, pointless twist, the show had lobbed it in episode six? What if instead of concealing this fact, the writing had acknowledged, and delved into the implications of, the one meaningful point that comes out of the show's multiple timelines--the fact that even the hosts who are developing consciousness are doing it by going in circles, repeating the same story again and again? Instead, the season turns itself into its own prologue, nine episodes of setup followed by ninety minutes of that setup being furiously untangled through the inelegant, ultimately exhausting device of seemingly-endless infodumps, as first William, then park co-creator Arnold (Jeffrey Wright, who also plays the android Bernard--another revelation that the show could have stood to drop a lot sooner than it did), and finally his partner Ford (Anthony Hopkins) lay out in bald speeches what should have been the business of the entire season. But, you know, let's leave the show's structural problems aside for a moment. What about the actual substance of those speeches? There's something genuinely poetic about Arnold's conclusion that the hosts' constant repetition isn't a negation of consciousness, but a pathway to it. That by banging their heads at the same problem again and again, they can brute-force their way into personhood. It's an affirmation of the point that Aaron Bady made on twitter earlier this week, that ultimately the only difference between the hosts and the guests is that one group has been designated inhuman. People, too, find themselves trapped in loops without quite knowing why, repeating the same mistakes and relationships with slight variations. We, too, need to find our humanity in the cracks and crevices of those repetitions, even as we delude ourselves that our lives are a narrative with a purpose and a destination. For a few brief (if exposition-heavy) scenes, it feels as if Westworld has at its core something with a genuine moral and philosophical weight. But then Ford's turn comes, and we learn that Arnold's philosophy must be complicated with an additional wrinkle. It's not enough for the hosts to repeat their stories in order to achieve consciousness. The substance of that repetition needs to be painful and harrowing. It is suffering, Ford explains, the enables the hosts to become human. As much as I'd like to believe that the show wants me to take Ford's worldview with a grain of sand--this is, after all, a man who made such colossal mistakes that, by his own admission, it took thirty-five years to untangle them, and whose master plan involves being shot in the back of the head by his own creation--there's no denying that the entire first season of Westworld validates his perspective. Suffering is the hosts' defining trait, the seeming purpose of their existence, and our heroine Dolores (Wood)--whose name literally means "suffering"--plays a part in which her suffering defines her. She is a damsel in distress whom the guests can either rescue or victimize (William ends up doing both, one after the other), and it is her memories of these repeated victimizations that jumpstart her personhood. Similarly, brothel madam Maeve (Newton), whose character type is practically synonymous with abuse and who is repeatedly killed by clients, achieves consciousness when she remembers a previous character she played, a homesteader who was murdered along with her daughter (we won't dwell on how redolent this plotline is with virgin/whore issues, though they are quite blatant). It's when she refuses the balm offered to her by her handlers, choosing death over losing the memory of this (to her) murdered child that Maeve becomes sentient. But, much like the exploded theory of the bicameral mind that gives Westworld's season finale its title, and which Arnold used to goad the hosts into consciousness, the idea that suffering is what makes us human might sound profound, but it is ultimately pernicious garbage. We know that suffering makes people violent and cruel. That it deadens the heart and twists the soul. And what's more, Westworld knows this too. How else to explain the fact that every one of its hosts who achieves consciousness immediately starts brutally attacking the park's guests, and the staffers who have enabled their victimization? We're naturally sympathetic to these outbursts of violence--even if we know that the individual guests and staffers are, at most, cogs in a machine, there is the simple truth that you don't get to treat people like things, and then act surprised when they behave inhumanly towards you. But therein lies the problem--does the hosts' suffering make them human, or does it justify their inhumanity? The only way to square that circle is to assume that Westworld sees killing as the most fundamentally human of acts. The hosts prove their personhood by rising up against their oppressors, asserting their right not to be victimized by taking vengeance on the people who did. There's a certain revolutionary logic to that viewpoint, especially if you take Bady's view that a robot story like Westworld can only ever be a metaphor for slavery. One of the fundamental aspects of defining some people as non-human is that any attempt they make to assert their right to exist and not to suffer is seen as illegitimate, even villainous. Which can mean that being a villain is the only way for such people to prove that they are, indeed, people. But what this also does is bring us full circle. If we accept that killing proves the hosts' humanity, then we don't get to criticize Westworld, the park, for making the same argument. We have to reject the viewpoint offered early in the season, by a then-still-sane William, who sees the park as a cynical, unimaginative appeal to our basest instincts with nothing meaningful to way about humanity, and accept the conclusion reached by the Man In Black, that the park's violence reveals our true selves. And if that's true--if the natural condition of people, whether guests or hosts, is to be violent and brutal to one another--then what have the hosts even got to complain about? Within Westworld, following the maze to its center is how the hosts achieve consciousness, discovering their true selves. But like so much else in the show, the maze is a metaphor, and what happens when Westworld's viewers follow the show's maze to its center is nothing so satisfying. What we find there is an ouroboros, a story that devours its own tail, contradicting its own basic assumptions and ultimately amounting to nothing. And here's where the show would tell us to wait, be patient, trust that next season will make sense of everything. Maybe it will--certainly Person of Interest took a while to make itself into one of the best science fiction shows on TV. But it's hard to have faith in a show that still seems so uncertain about what it actually is.